Happy Mother's Day to all the mom's out there in blogland! I hope your day was filled with love and happy times. I know that my day was very peaceful, and I enjoyed spending it with my kids. The past few days have really been a time of reflection for me. Right now, tonight, although I have a lot of issues that I am dealing with concerning my life as I know it, I feel at peace with myself. Wow... I almost forgot how that felt. Let me back up a little bit... oh, let's start on Wednesday. My mood dropped very low on Wednesday. I looked forward to hanging out with a friend of mine for Cinco de Mayo, and at the last minute the plans changed. I admit, my feelings were kinda hurt because of the circumstances, and I immediately got depressed. Maybe it's because I had been binging all day.... I felt fat, disgusting, and rejected by my friend. Honestly, I binged until I was sick. I vomited until Thursday morning, and was even late for work because I was so nauseous. I trudged through Thursday, and got off from work early on Friday because it was an in-service day (no students). I have been wanting to read my book (Women Food and God by Geneen Roth), so I decided to take some time to read and sunbathe a little in my back yard since the day was so beautiful. I was craving sunshine and there was plenty to go around! I read about half of that book, and let me be the first to tell you it is an awesome book. I could identify with about 90% of what she was saying, and it just made me so emotional. I just sat out there thinking for a while - just why am I so unable to love myself? Why do I set myself up for failure? Why do I accept failure in my life? Why do I settle for less than what I am worth? Why am I killing myself with food? My mind has been in "reflection" mode since then, and I have been really thinking about my life a lot this weekend. My circumstances are not the best at this time in my life, but they could be so much worse. I am a strong woman. I deserve so much more than I settle for. I am so close to achieving my goal of being a teacher and completing my Master's degree. My children are healthy and happy and well behaved. I have a nice home and even though it's a struggle, I pay my bills on time and my car is dependable. I might not have much, but I have a lot more than some people out there. I am blessed. I have allowed my weight to define who I am for so long. Just because I fail at weight loss does not mean I am a failure as a person. I have just made myself believe that for way too long. Every time I am successful at weight loss, I start letting the bad thoughts about myself creep back in. I tell myself that I can't do it for the long-term, or that I am not meant to be thin. I also use my fat as protection. When I am fat, I feel unattractive, and I don't have to worry about men approaching me. I don't have to worry about my appearance, or how my clothes look because fat people are invisible, right? Sometimes I just like being invisible... I just want to blend in. But sometimes I want to feel pretty. It's kinda nice to look in the mirror and like what you see looking back at you. I hate the feeling of being embarrassed and horrified at my reflection. I went out on Friday and bought myself a new outfit. I have been waiting "until I lose weight" to buy myself something, but I decided that I wanted something NOW. I was pleased that I could wear a size 22 in everything I tried on. My top is even an 18/20. Today I cooked for Mother's day because my mom and best friend were supposed to come over. Neither showed up. But that didn't stop me from having a great day. And guess what else? I didn't over-eat. As a matter of fact - I have been binge-free since Wednesday. I have been only eating when I am hungry, and I have been making good choices. Today, I made a pie and it didn't send me over the edge. I was able to put it away without one thought of binging. I actually have a lot of left-overs in the 'fridge for tomorrow. Although I was a little sad that my mom and my friend didn't show up for my little cookout, it didn't ruin my day. It didn't make me binge on all the delicious food I had cooked. I just moved on and let it go. I will take that pie to work tomorrow and let my co-workers enjoy it. I don't even want it. Right now I feel peace regarding food. It's really a strange feeling for me. Today I just felt happy for who I am right now - not who I will be when I am finally "on plan" or "sticking to my diet". Today, I almost feel as if I can do this - as if I am going to "get it" and achieve my goals. Not just for weight loss - but for everything I want to do in life! Right now. If only for tonight, I feel at peace with ME. And my weight doesn't have anything to do with it. Thank God for peace in your heart, Hollie. You come across as such a wonderful woman. I can't even imagine why you'd ever sell yourself short. I'm glad you made yourself up to feel good and also to buy an outfit for you now. NOW is all we have. I feel at peace with my food, too. I just wrote that in someone's comments and then here I am reading you feel the same way. It's a good feeling. Goodnight Hollie. I hope all this goodness blends in to all your days ahead. So glad you have been able to make peace with the now. That is the only way we can move forward, but it is certainly easier said than done. Please know that you are not only blesses, you are a blessing. To all of us who read your blog and know that we're not alone. I know your struggle so well. I should not have read this on my way out the door because now im blubbering like an idiot. I know all those feelings and then some, so first and foremost know you are NOT alone. you are NOT invisible and you are GORGEOUS!! I want to say i don't understand why you can't see how beautiful you are but i know the answer already and one day you will! You will look in the mirror and the person on the outside will match up with the person on the inside. You are such an amazing person and it's you who always gives inspiration. No you don't NEED to be thin,, but you DESERVE to be anything you want to be, and you have the strength to do it! Fear is a trick, a safety net, overcoming it will not be easy but God has a plan for you, and every struggle you have strengthens you. I wish you all the comfort and peace in the world Hollie. P.S. not sure if you got it but i emailed you. You are a beautiful person. I know this because of the kindness you have shown me and it comes across in you blog. I hope and pray that someday that really sticks in your heart. You are loved, you are beautiful, you are valuable. Just the way you are. I am glad to hear you have peace. May that peace stay with you. You are so right Hollie about not losing as a person if you don't lose weight.You can never truly lose as a person, unless you give up. I think weight loss or losing weight are such a negative way of looking at getting slimmer. I think we should focus more on what we can gain, like, better health, more energy and a feeling of control. Good luck with your progress and your blog is very honest and all inspiring. Good for you!!! This is by far the best post that i have read ANYWHERE since creating a blog! I loved your honesty, your outlook, and your progress. You're right, you are a strong women! By the way, I have said it before and I will say it again....YOU ARE NOT A FAILURE AT WEIGHT LOSS!!! !You hear me?!?! sounds like youre doing great! hope you had a lovely mothers day. Hi Hollie, I'm new here, but I feel like your post was meant for me to see. Thank you for your honesty. I share in your struggles and had a bit of a backslide this weekend. 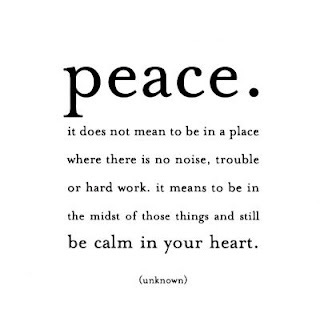 But, I am at peace today also because I know that I am never going back to hiding behind my weight. I stumbled upon your blog today and have been enjoying reading about your journey of self discovery. I myself just recently rejoined WW. I looked at the other options out there and realized that WW is the only one that really makes you work on yourself from the beginning. You have to make the right food choices instead of openning a prepackaged meal. Let me know if you need support on sticking to the plan. I am definitely going to be looking into a couple books you mentioned also. Thanks and good luck on your journey. This was one of the best blogs I have ever read. You are doing so good and I am glad that you feel good about yourself. We all have good days and bad days! Its just important to recognize the bad days and move on from them. Easier said than done. But we can do it!!! We all "hide" in some shape or form. I hid in my weight. I also hid in my long hair. I cut about ten inches off my hair back in January, and sometimes I do regret it because it hid my back side. Now I've been forced to get my body in gear. I hope you find a way to love yourself more. Peace is amazing! Sounds like your doing good. Hugs to you, Hollie. I can really relate to your feelings about the weight. Been there..do that..... A lot of it IS a mental game. One thing I have noticed is that it is actually easier to be a bit invisible when I want to be now...than it was when I weighed so much. When I want to...I can draw much less attention to myself now than I did then. It was hard to miss me back then...lol. Now...a baseball cap, some sunglasses..and I am off for a run incognito...and without causing much of a reaction. I am glad that you had a good day yesterday. It really sounds like you are in a place, mentally..where you are going to be able to tackle this once and for all and stop giving it so much power over you. It will be a good thing. I'm here to cheer you on and to encourgage you to get strong on the inside and out....lean on me if you need to. I'm on this journey for the rest of my life and am happy to be a support whenever possible. You DO deserve to be the healthiest and strongest person you can be. And, you ARE strong..and getting stronger every day. Keep up the great work.